Hey Guys. I hope everyone is blessed and feeling good for another read. I train with many female clients and all of them thus far have said to me in one way or another “I don’t want to lift weights, I’ll look like those female bodybuilders”. 1) Dropping Body Fat – You may have been told that cardio is the ultimate fat burner, but that effect diminishes soon after you’re done with the bike. Build more muscle and you’ll keep your body burning fat all day long (due to increased metabolism). Studies show that adding just two sessions per week of heavy lifting can reduce your body fat by three percent without cutting calories. 2) More definition – Dr Jason Karp an exercise physiologist and author has proven that due to low testosterone levels women can’t build huge muscles. All that will happen is your muscles will become more dense and tighter which will equate to a leaner defined physique. 3) Burn more calories – You may burn more calories during your 1-hour cardio class than you would lifting weights for an hour, but a study published in The Journal of Strength and Conditioning Research found that women who did weight training burned an average of 100 more calories during the 24 hours after their training session ended. 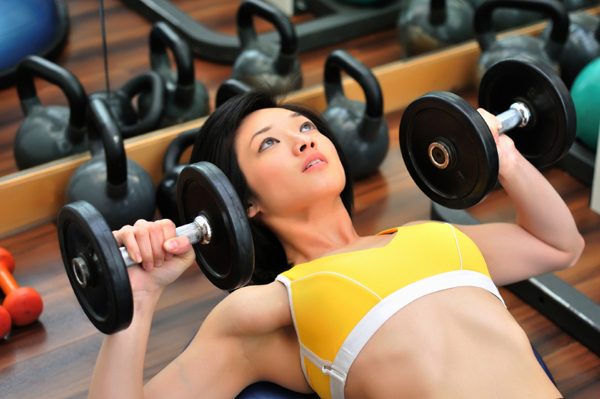 4) Get Stronger – Lifting heavier weights will get you stronger and may help to boost your confidence. Exercises using your own body weight is great to start out with, for example, press ups, bodyweight squats, pull ups, lunges… just to name a few. You can then progress into compound exercises. These are just 4 examples, in part 2 I will go into more details and more science. For now I’m just trying to open up the eyes of you beautiful women out there who are afraid of the iron. 90% of the time women trying to loose fat go about if the wrong way with all these fad diets and crazy “10 minute to a thinner you” training programs that you see far too often in these magazines (I won’t state names). To be honest with you it’s not easy all this getting in shape stuff. Watching what you eat around the clock, counting calories or weight watcher points or whatever path you are taking. But I tell you what… it’s possible…And it’s very much do-able if you want it bad enough. All it takes is some education (nutrition & training), dedication & consistency, no special pill or special operation. That is the secret…But no one wants to hear that! This applies to you guys as well. Once we accept that we have to put in 100% effort we then mentally gear ourselves up for a journey that will have many ups and downs, twist and turns but a very rewarding outcome, a better and stronger you. If you’re a guy reading this, show it to your girlfriend or a female friend. If you’re a female reading this, share it with a friend…Let them know as you have just learnt, weights can do you some good. Thanks to Charlotte Andersen for your insight and philosophies on women and training.